You read that right! Disney is making the rounds in planning a Star Wars-themed resort at Walt Disney World. Polls are going out to guests of the theme park to gauge interest in different experiences that would bring Disney guests to the galaxy far, far away. In this resort, guests will stay two nights in a luxurious room decked out to resemble a star-ship. They will be able to interact with popular Star Wars characters and grab some snacks at the Cantina, served by robotic butlers. 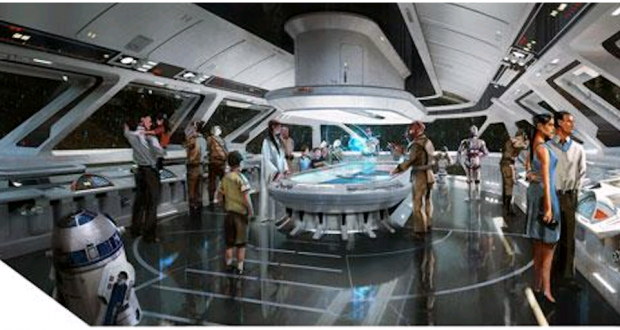 The resort will also have programs for guests such as lightsaber training and personalized secret missions. Of course, since it’s Disney World, the tickets are expensive, ranging from $900 – $1,000. The most curious and perhaps most interesting part of all this is that guests will be treated to a unique story experience during their stay. Now, the article does not go into detail about this, but already my speculative mind is working. It could probably be nothing, but we already know that the new Star Wars lands will feature a new planet that is considered ‘canon.’ Could this personalized story also introduce us to new canon elements of Star Wars? It might break the bank to find out, but it’s Star Wars, so it’s probably worth it! Honestly, I don’t know why it would just be a two night thing. It would be amazing if the resort could be just like any other and guests could stay as long as they would like. This would definitely be my go-to place to stay during Disney vacations. Would you be interested in a resort like this? Give us your thoughts and ideas on what should be at this resort in the comments below. Untitled Han Solo Film: Loses Directors, Gains a New One?